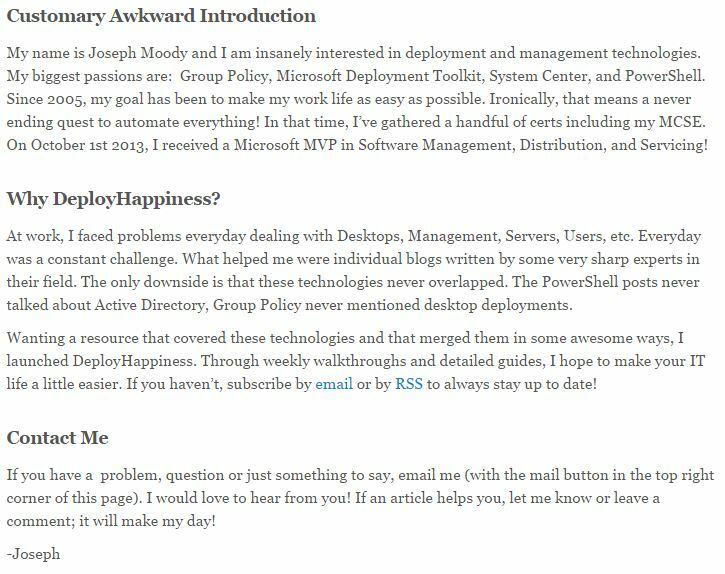 I just found a insanely great deployment/group policy site for those of us ‘in the BIZ’ called DeployHappiness . Joseph, you’ve put together a kickass site, sir. Thanks! This entry was posted in Group Policy, IT Blogs, IT Philosophy, IT Resources, Reference Material, Scripting, TechTalk, Windows. With thanks to my son, Greg. You’ll find this article fascinating! This entry was posted in Browsers, MacOS X, Python, Scripting, WebTech. Necessity being the motherf***er of invention, I took my first step at becoming an IT adult. I was inspired by my colleague Dean Bunn here on the UC Davis campus who has done incredible scripting to automate and make our IT day a little shorter and easier. Thanks, Dean. I used The Windows PowerShell Library at Microsoft’s TechNet site for syntax and use. Great resource! This script is presented with no warranties, rights or responsibilities for it’s use in any situation. If you use this script for your own purposes, it’s your fault if you EFF something up…PERIOD. I recommend that you “#” (comment-out) the Clear-EventLog $log -ComputerName $server line before you start modifying and testing the script. You’ve been warned. # save the logs as CSV files on your local computer and the remote server. # Your local computer has a C:\adminlogs directory. # Your remote server has a c:\adminlogs directory. # You are logged into a computer with the proper setup to obtain NETBIOS resolution. # credentials that cover your local and remote connections. # entries in anything but the security log. So, please disregard those errors, if encountered. # First loop: Yank each servername in-turn. # Second loop (nested in first, to get/save each log from the specific server in-focus. # $filname is going to equal the local adminlogs path + the name of the file. # $sharename is going to equal the remote server’s path to the adminlogs directory + the name of the file. # Now get $server’s $log and export it to your local adminlog directory for review. Then tell me that you’ve done it. # Now get $server’s $log and export it to the $server’s adminlog directory for safekeeping. Then tell me that you’ve done just that. # OK…Eventlog saved, now clear the event log and go on to the other logs/servers. This entry was posted in PowerShell, Scripting, Windows, Windows 2008 R2, Windows 7.